Farnham was incorporated under Gilbert's Act of 1782 which gave parishes greater control over the administration of poor relief including the ability to operate workhouses for the elderly and infirm and children. A new workhouse was built in 1791. The Poor are farmed in a Workhouse, built in 1791, on a good plan and stands in an excellent situation about half a mile from the town. The old Workhouse stood in the town and is said to have been a most wretched one. The contractor is allowed the use of the house and furniture, and the earnings of the Poor, and receives £1,000 a year for which he is bound to maintain the Poor of every description, but not bear the expense of removals, appeals, or other law contests. There are at present (Oct., 1795) 124 inmates, of whom 50 are old and infirm, and generally about the same in winter. There are a few out-pensioners, but the payments are very trifling, as it is more for the interest of the contractor to offer the Poor who apply for relief no alternative but the house. The infirm who can work are employed in picking wool, the children attend the carding machine, spin, etc., and are taught to read twice a day. Boys and girls, men and women sleep in different quarters of the house. The contractor says he keeps no account of expenses or earnings. Table of diet: Breakfast-Sunday, Tuesday, Thursday, Saturday, onion pottage; other days, bread and broth. Dinner—Sunday, Tuesday, Thursday. meat pudding and vegetables; other days. bread, cheese and beer. Supper—Sunday, Monday, Thursday, bread and beer; other days, bread. cheese and beer. Such women as have friends who give them tea and sugar for breakfast, have bread allowed them. The parish is generally assessed at half rental. The rate, however, is seldom very regular, as farms are assessed at half-rental where the rent is known. Owner-occupiers are not rated at more than what the farm was let for 70 years ago. The parish is now undergoing a new survey and valuation. The sum paid to the county stock is very fluctuating. The cost of building the Workhouse was near £4,000. of which £800 has been repaid. About £100 were subscribed last winter (1794-5) to which £200 were added from the rates for selling bread to the Poor at reduced prices. The tradesmen complain that the farmers would not raise the wages of labour, but got the labourers supported by the parish, though reaping great advantages from the very cause of labourers the becoming necessitous. When the Poor are not farmed, rates were highest. and have fallen when they were farmed. The reason is obvious: a contractor's object is gain. He therefore allows little to the Poor outside the house and keeps those in it closely to work, by which means the idle, the lazy, and—it may be added—the modest Poor and old people (who decline making applications that would oblige them to quit old habitations and neighbours for perhaps more elegant apartments and profligate associates in a Workhouse), often go unrelieved. Because of its status as a Gilbert Parish, Farnham fell outside most of the provisions of the 1834 Poor Law Amendment Act. However, in 1846, Farnham and the adjacent Gilbert Parish of Aldershot and Bentley were persuaded to adopt Poor Law Union status under the 1834 Act and together formed the new Farnham Poor Law Union. Its operation was overseen by an elected Board of Guardians, 19 in number, representing its 6 constituent parishes (figures in brackets indicate numbers of Guardians if more than one): Aldershot (2), Dockenfield, Farnham (9), Frensham (3), Frimley (3), Waverley. 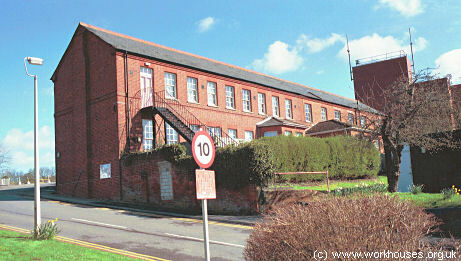 The new union adopted the existing Farnham workhouse which was located at the north of Farnham between the modern Hale Road and Guildford Road. Considerable additions were then made to the buildings including a central dining-hall and kitchens, an infirmary, and a two-storey block for the aged. Following the establishment in 1856 of the army camp at Aldershot, the number of syphilitic cases entering the workhouse increased ten-fold and part of the aged men's block used for their accommodation. In 1864, the aged men were moved to the front building of the workhouse, formerly used as a tailor's workshop. The workhouse site is shown on the 1871 map below. Many of the buildings were dark and poorly ventilated, with bare dirty walls and narrow beds. Sanitary facilities were poor. Only two towels per week were provided for each ward. No toilet paper was provided. Only one nurse was employed and there was no nursing cover at night-time. Inmates were not given forks with which to eat their food. The casual wards were described as being like rabbit-hutches. Vagrants staying there were given no food. The recently departed workhouse master, James Sargeant (the great-great-grandfather of Labour leader Jeremy Corbyn), in post for fourteen years, was described as having been despotic while the Board of Guardians had been totally ineffectual. The Poor Law Board inspector, Mr Farnall, was also condemned for his conduct, having regularly reported that the workhouse was 'good' or 'satisfactory'. Further details of the Lancet inspection are in the full report. Its publication resulted in an extensive inquiry by the Poor Law Board. Although the Board concluded that some of the most serious charges were either untrue or exaggerated. However, many of the Lancet complaints were accepted. A number of additions were made including two infirmary blocks, one at the south of the workhouse in around 1870, and the other at the east in around 1900. Farnham 1870 infirmary from the south-west, 2001. Farnham 1900 infirmary from the east, 2001. The extended workhouse buildings are shown on the 1916 map below. 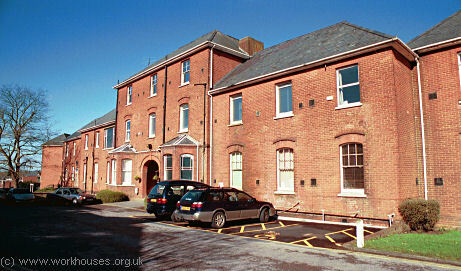 After 1930, the former workhouse became Farnham Institution and then Farnham Hospital. The main workhouse was demolished but the two later infirmary blocks survived until the complete redevelopment of the hospital site in 2006-7. In 1849, Farnham joined with the neighbouring Hartley Wintney Union to establish the Farnham and Hartley Wintney School District, through which education for pauper children was jointly provided by the two unions. A separate page describes the operation of the Farnham and Hartley Wintney District School. Surrey History Centre, 130 Goldsworth Road, Woking, Surrey GU21 6ND. Holdings include: Guardian's minutes (1872-86, 1892-1930); Baptisms (1908-34); Creed register (1873-79); etc.